Sailing the winds of Paradise! 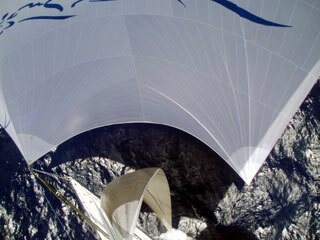 Our work-horse (No pun intended), the 4A masthead spinnaker and the little fractional staysail, Makani Hula! Just beautiful sailing here. The team is working hard, grinding on every wave. We’re surfing the Hawaii and that is how it should be. Pegasus 77 loves it: She can smell the barn. Goals are key to any team. So, our goal is to win this match race with Pyewacket. We’re now setting secondary goals for the team. Goals need to be achievable or they are meaningless. For example: the course record can only be achieved at this point if the trades kicked-up to a steady 25 knots. That’s very unlikely. Yesterday, it didn’t appear that we had a shot at beating Stan, Sally, Skip and Jon on their Cal 40 Illusion to the finish. They started 5 days ahead of us and in general had more favorable weather all along. However, yesterday Illusion made a little incursion North that they seem to have later regretted. 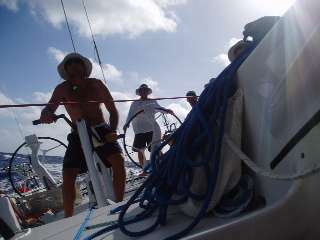 They now have gone back South for more breeze and sailed a few extra miles in the process. Hence, there may be a little window of opportunity for a secondary goal. That’s a fun bet for the team on Pegasus, because its a pursuit race. Perhaps what the Barn Door should be in the future to attract back the Santa Cruz 50s, 70s, the other sleds etc…: Whoever gets there first wins the prize. I love it because Skip Allan taught me how to navigate the North Pacific Ocean when he and I won the Pacific Cup in 1988, setting a record that held for 10 years with a chartered Santa Cruz 70 designed by Bill Lee. So for the fun of it, we’re going to try and catch Illusion. 14 hard working sailors/athletes need to be fed 7 by 24 for over 7 days, no refrigeration (too heavy, Pegasus is all built in carbon fiber to be the lightest it can be), so it's zone-meals, all balanced 40/30/30, frozen in boil bags. Jeff is in charge of nutrition logistics. We have three camping burners to heat up the pressure cookers. Simple, Spartan, efficient and actually delicious. the 42nd Transpacific Yacht Race to Hawaii. designer Bill Lapworth and builder Jack Jensen had claimed that honor. positions reported in Friday morning’s daily roll call. Yacht Harbor after the victorious finish in ’69. Some of the boats out there this year aren’t having many laughs right now. northerly route than the current leaders. Now it’s too late to change. from 43 to 55 miles Friday. adventure, according to e-mails sent home from the boat. 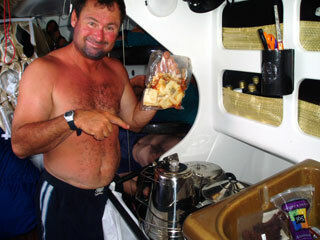 1. Pegasus 77 (Reichel/Pugh 77), Philippe Kahn, Honolulu, 983 miles to go. 2. Pyewacket (R/P 75), Roy E. Disney, Los Angeles, 1,038. 1. Alta Vita (Transpac 52), Bill Turpin, Santa Cruz, Calif., 1,091. 2. Beau Geste (Transpac 52), Karl Kwok, Hong Kong, 1,113. 3. Grand Illusion (Santa Cruz 70), James McDowell, Lahaina, H.I., 1,170. 4. Pendragon 4 (Davidson 52), John MacLaurin, Marina del Rey, Calif., 1,208. 5. Medicine Man (Andrews 61), Bob Lane, Long Beach, Calif., 1,089. 6. Icon (Perry 65), Richard Robbins/Jim Roser, Seattle, 1,170. 7. Bengal II (Ohashi 52 ),Yoshihiko Murase, Nagoya, Japan, 1,257. 8. Vicki (Andrews 68), Al and Vicki Schultz, Long Beach, 1,191. 9. Helsal II (Adams 60), W.E. Rawson, Melbourne, Australia, 1,314. WD—Renegade (Andrews 70), Dan Sinclair, Vancouver, B.C., Canada. 1. Maitri (J/160), Peter Johnson, San Diego, 838. 2. Reinrag2 (J/125), Tom Garnier, Portland, Ore., 1,851. 3. Innocent Merriment (J/160), Myron Lyon, San Diego, 1,872. 4. Jeito (J/145), Francisco Guzman, Acapulco, Mexico, 877. 5. Pipe Dream IX (J/160), Scott Piper, Coral Gables, Fla., 927. 6. Horizon (Santa Cruz 50), Jack Taylor, Dana Point, Calif., 953. 7. On Point (Schock 40), Nick Martin, Wilmington, Calif., 988. WD—Lucky Dog (J/125), Peter Putnam, Newport Beach (DH). 1. Wild Thing (1D35), Chris and Kara Busch, San Diego, 964. 2. Hot Tamale (J/120), Tom and Doug Jorgensen, Glendora, Calif., 1,007. 3. Tabasco (1D35), John Wylie, San Diego, 1,006. 4. Cool Man Cool2! (Sydney 38), Harrell Jones, Dana Point, Calif., 1,033. 5. Swept Away (J/120), Louis Bianco, Seattle, 1,047. 6. Paddy Wagon (Ross 40), Richard Mainland, Marina del Rey, Calif., 997. 7. Tera’s XL (ILC 40), Antony and Daniel Barran, Northridge, Calif., 984. 8. Two Guys On the Edge (1D35M), Dan Doyle, Honolulu, 1,039 (DH). 9. Bolt (Olson 40), Craig Reynolds, Balboa, Calif., 1,066. 10. Krakatoa (Young 32), Rod Skellet, Sydney, Australia, 1,104. 11. Lawndart (Cape Bay Fast 40), Bill Allan, Nanaimo, B.C., 1,161. 1. Wind Dancer (Catalina 42), Paul Edwards, Wilmington, Del., 587. 2. There and Back Again (Tripp 40), Robert Rice, Long Beach, 531. .
3. Masquerade (Choate 40), Timothy Coker, San Diego, 621. 4. B’Quest (Tripp 40), Challenged America/Urban Miyares, San Diego, 613. 1. Illusion, Stan and Sally Honey, Palo Alto, 572. 2. Seafire, John T. Harrison, Honolulu, 659. 3. Ranger, William Partridge, Richmond, Calif., 663. 5. John B, Greg Boyer, Newport Beach, Calif., 686. 6. California Girl, Don and Betty Lessley, Point Richmond, Calif., 679. 7. Flying Cloud, Darrell and Scott Wilson, Long Beach, 689. 8. Willow Wind, Wendy Siegal, Sunset Beach, Calif., 704. 9. Celebrity, Gerald Finnegan, Redondo Beach, Calif., 718. 10. Redhead, Andrew Opple, Ketchum, Idaho, 788. 2. Enchanted Lady (Roberts 55 ketch), Andy Sibert, Seal Beach, Calif., 568. 3. Incredible (Swan 53), Rick Gorman, Los Alamitos, Calif., 541. 4. Beautiful Day (Beneteau 47.7), William Boyd, San Diego, 535. 5. Marla R (Beneteau 50), Jon Richards, Mesa, Ariz., 557. 6. Axapac (Wylie 39), Barry Ruff, Vancouver, B.C., 622. 7. Lady Bleu II (Dynamique 62), Roger and Brenda Kuske, San Diego, 478. 8. Beach Music (Tayana 52), Kirby Coryell, Lafayette, Calif., 693 (DH). 2. Sea Dancer (Ericson 35), Alvin Wheatman, Marina del Rey, 905. 3. Pipe Dream (Choate/Feo 37), John Davis, Long Beach, 943.